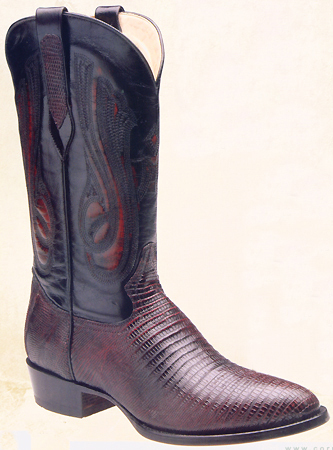 Black Cherry (burnt apple) color Teju Lizard foot. Leather outsole on an all leather upper. Glove lining. Choose from R, J (shown), X toes. Slightly underslung walking heel. Handcrafted. 13 inch top. Several toe styles available. Burnt Apple shaft of soft dress leather. Fancy tug straps and deep scallop. Hand made exotic boots.